Live chat is fast becoming the new standard in ecommerce. Customers expect the same service online as they’d receive in your shop, and can easily browse elsewhere if they don’t get it. Meeting their needs means live chat software, and exceeding them means WhosOn. Did you know that chatters are worth 4.5x as much as website visitors who don’t chat? Or that chatters spend 60% more per purchase than non-chatters? How about the fact that 77% of online shoppers want to contact a real person before buying? 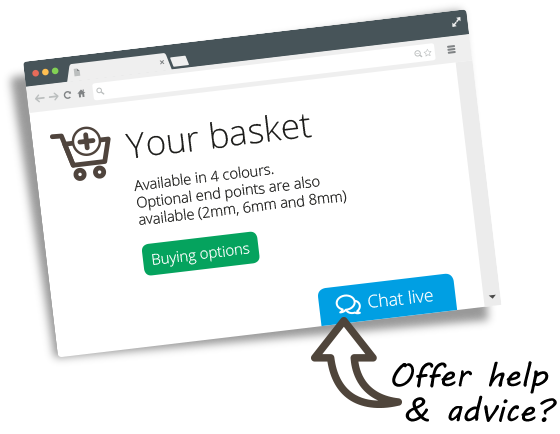 It’s simple: chat turns browsers into engaged users. And engaged users who have a supported web journey are more likely to buy. If you can be there to assist and nurture leads, you can steer more prospects to purchase. The most important priorities for consumers are getting through to an agent quickly (80%), and the speed with which their inquiry is resolved (74%). In both instances, live chat is your best bet for satisfying customer needs. 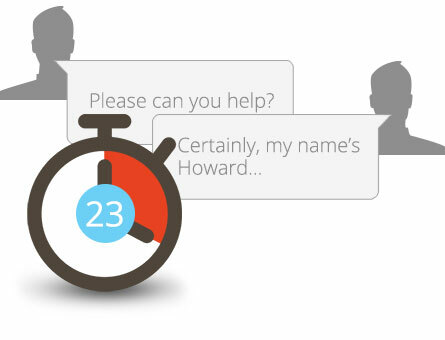 With live chat, the average response is 23 seconds; the average resolution 42 seconds. A live web channel puts customers directly in front of the agent they need, directly from the page they were browsing, offering direct help with their need. The result is resoundingly increased satisfaction. Put the wealth of your CRM behind your website. Live chat software can take key customer information from your CRM, to enhance the user’s session. But it can also feed chat data back into records, to keep your accounts current. With WhosOn, leads are auto-created in your CRM. Records are added or updated with contact details and sessions transcripts. Unhappy customers are identified, and satisfaction scores calculated. Coupled with your CRM, chat is a powerful online sales and service optimiser. 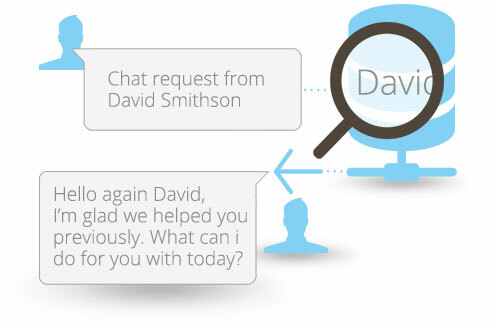 Live chat software allows you to enhance a visitor’s journey in a way that’s personalised and relevant. Using its inbuilt analytics, you can see user details such as location, identity, pages visited and time on site. That means you can offer informed, accurate help throughout the chat session. With real-time, retail-focused insights on the user and their activity onsite, you can take a targeted approach to the chat session. In short, live chat enables you to offer surprisingly good service online. Is a visitor browsing your site from a certain location? Send them an automated live chat message with local offers. Visitor just finished reading a long help file? 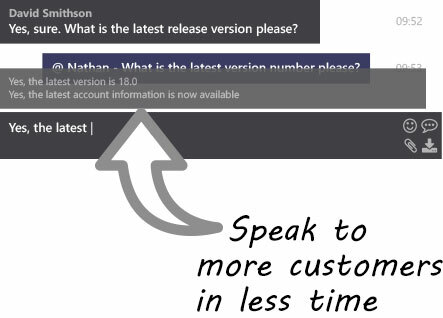 Send an automated chat invitation asking if they’d like to speak to technical support. WhosOn enables you to send rule-based, automated live chat invitations to website visitors at opportune points in their journey. Your customers get proactive support that’s tailored to suit their needs – without any extra effort for your agents. WhosOn isn’t only about chat. It’s also packed with web reporting features, to offer insight into online experience. 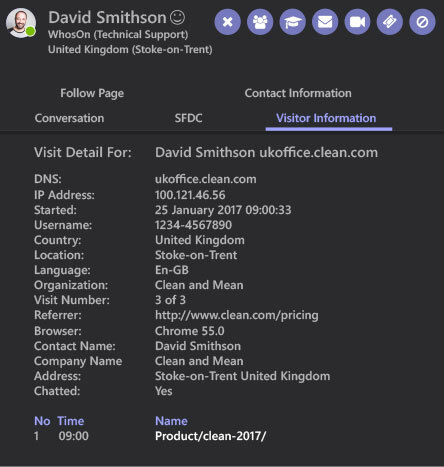 You get real-time data on everything from individual IP look ups, to user journeys, to previous visits and past chats, to new prospects, to page and usage trends. This granular detail allows you to track visitors as they move through your site. And for a quantitative view of data as daily overviews and monthly trends, there’s a full set of reports. To optimise your site and understand its audience, choose WhosOn.